Winter weather is coming. In some areas, the weather will be less severe than others. However, it never hurts to be prepared, and that includes your home’s roof. There are a few maintenance tips you can use to prepare your roof for winter in MO. 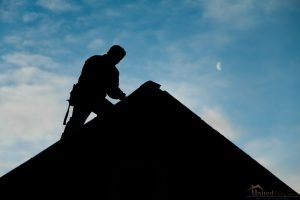 Prepare Your Roof for Winter with Professional Roofers. Water spots on your walls or ceiling could mean roof leaks. 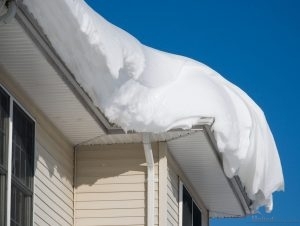 You don’t want leaks in your roof to persist in winter. Check your vents and shingles, too. Loose vents leave room for moisture to enter your home. 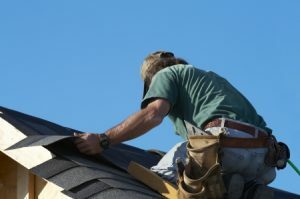 If you are concerned about any of these problems, hire a professional roofer to inspect your roof for these problems. If any roof leaks are found, have them fixed immediately. You don’t want mold in your home, and waiting until after winter leaves your open to this sort of damage. Anywhere that water should be diverted away from your roof and home should be cleaned and checks. Gutters clogged with moist leaves create the potential for roof rot. This moisture may also freeze and weigh down your gutters and downspouts. When all that water melts, you could have a real mess on your hands. If you need some help with gutter cleaning, hire a professional. If you do find that something may be wrong with your roof, there is only so much you can do. That is when it is time for you to hire a professional roofer for an inspection. A roof inspection will determine what problems you have, the extent of any damage, and what repairs you need, if any. There is always the chance that there is no immediate concern. Whether you need roof repairs or installation, or to prepare your roof for winter, trust our roofing professionals at United Roofing Services. Call 816-228-1158 today. Posted in Uncategorized on November 21, 2017 at 5:22 pm by United Roofing Services. 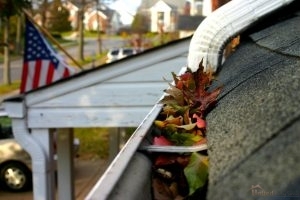 Cleaning Your Gutters Is A Fall Necessity! With Fall briskly on its way, homeowners with trees are bracing for the inevitable piles of leaves to fill their yards. While everyone knows that piles of leaves in the yard can cause mold growth, as well as kill the grass, not everyone stops to think about their gutters! Leaves can choke and clog your gutters, which damages your gutter system, and puts your roof at risk. Today we will discuss the basic steps required to adequately clean and prepare your gutters this fall. When you have all of your supplies together, you can set up your ladder in the appropriate space. It is better to use a ladder that stands on it’s own, rather than a ladder you need to lean against your roof, as you can rely on it to be more stable. However, if you do use a ladder that will lean up against your roof, make sure your ladder is completely stable. When you climb up the ladder, be sure to remember the rest of your supplies! Keep in mind that it is safer to clean the gutters from your ladder, not from your roof. Sitting on your roof can cause additional damage, as well as be very unsafe. Using the scoop, or your gloved hands, remove the leaves from your gutter. If you chose to use a bucket, put the leaves in the b bucket. If not, throw the leaves on the ground, but understand that gives you more work later on! Make sure to remove all signs of sticks and debris. Once you have removed all of the debris from your gutters, you should rinse them to keep them in good condition. Use the hose to flush out any residual dirt, dust or pollen. If you need any additional help with gutter replacement or gutter repair in Kansas City, MO, give us a call today at United Roofing Services! Posted in Uncategorized on September 18, 2017 at 1:53 pm by United Roofing Services. Energy Star rated roofs help building owners preserve air conditioning, and as a result, their energy bills. Certain roofs are known to reduce cooling demand by up to 15%. People inside will be more comfortable, and you will be spending less on energy bills. 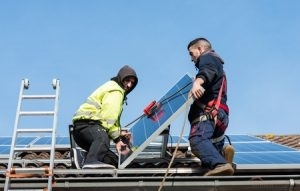 The most attractive part of energy efficient roofs for many building owners, is their potential to save money. The specifics of how much money you will save can be determined through this Cool Roof Calculator which is offered by the Department of Energy. Calculate your potential savings to get a better idea of your next step. Yes commercial building owners want to save money, but it doesn’t hurt to preserve the environment in the process. By decreasing power plant emissions, you are regulating the output of dangerous fossil fuels. An energy efficient roof can cut costs, and help the environment at the same time. If a roof is tagged with an Energy Star rating, it can reflect harmful UV rays from your roof and significantly lower the surface temperature. 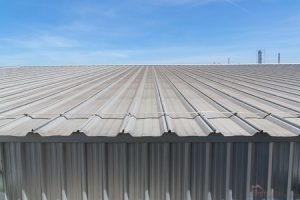 This feature will keep your building cooler, but also expand the life span of your roof, by not subjecting it to constant heat damage. Call 816-228-1158 to discuss Energy Efficient Roofing with our experts at United Roofing Services. Posted in Uncategorized on August 14, 2017 at 4:53 pm by United Roofing Services. How Can I Tell If My Roof Has Been Damaged By a Storm? Signs That Your Roof Has Been Damaged By a Storm. 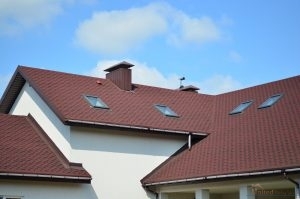 Our residential roofs are what keep ourselves, family, and belongings protected. They are also beneficial when a big storm hits Kansas City. While they are great at keeping families and valuables safe, they can become damaged due to severe storms. But how can your tell if a roof has been damaged by a storm? Below are some signs to look out for. If you have leaks coming from your ceiling or water spots on the wall after severe weather, that could be a good indication that your roof has been damaged by a storm. You can check your roof to see if shingles are missing, but if it was a very windy or serious storm, chances are that there are a few shingles scattered on your lawn. Did this severe storm produce hail? This is another big sign that your roof has been damaged by a storm. Because hail is very hard and comes down fast, it has the potential to do serious damage to your roof. Gutters are pretty sturdy, but if you see any dents on your gutters after a storm, it might be good to check your roof. If your exterior walls or even windows were perfectly fine before a storm hit, there could be a chance your roof is damaged, as well. While you can get on your own roof to check for missing shingles, dents in flashing, or damaged fascia, a professional can determine damages due to your roof quickly and safely. If you need residential storm and hail damage roof repair in Kansas City, MO, call the roofers at United Roofing Services at 816-228-1158. Posted in Uncategorized on July 11, 2017 at 6:24 pm by United Roofing Services. Climate plays a major role in roof deterioration. The hottest months of the year are the time when roof shingles become clawed or curled. This condition can lead to further problems in colder seasons because of added vulnerability to ice and wind damage. There are many causes for missing shingles. Hail storms, damaging winds, lack of roof maintenance. 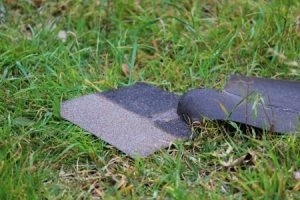 A missing shingle opens the door for ponding water on your roof. Over time, this water can leak into the underbelly of your roof and eventually penetrate your ceiling. Humid areas cause roofs to be vulnerable to mold growth. Your roof can begin to deteriorate If your asphalt shingles develop mold growth. Once deterioration begins, the overall structure of your roof is weakened, leaving you open to severe and expensive water damage. The edges of your roof should be line up with your gutters. If this is not the case, your home may have an unaligned roof. If you notice sagging in your roof, it may be the result of extensive water damage. Call United Roofing Surfaces today at 816-228-1158 for a full roof inspection. Posted in Uncategorized on June 7, 2017 at 4:24 pm by United Roofing Services. Which Roofing Material is the Best Fit for Me? So you’ve decided that’s it time that you replace your roof. This is a major decision that you are making and should be treated as such. 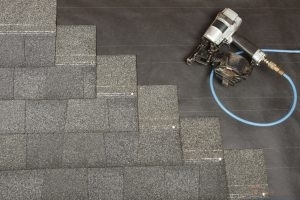 Choosing the right roofing material can potentially add to the overall market value of your home or business while effectively communicating the look and feel. Although there are important things to think about, such as framing and making sure that it’s properly installed, picking the material can potentially elevate the exterior look of your property to an entirely new level. Are there any maintenance or installations specifications to consider? Does this roofing material meet the fire codes of my area? Is this material available in a variety of styles and colors that will, indeed, enhance the look of my property? What is the expected lifespan of the material? Will the cost of this product be within my budget? Will the weight of this material make it that special framing is necessary? Will this material be able to withstand the severe weather that is normal in this area? Once you have a clear cut answer for each of questions, then you’re just about ready to get your roof replacement started. The experts at United Roofing Services knows that this can be a difficult and stressful process, but we are here to lend a helping hand from start to finish. If you’re considering roof replacement or roof construction in Kansas City, MO, contact us at 816-228-1158. Posted in Uncategorized on May 5, 2017 at 9:09 pm by United Roofing Services. Gutters keep your roof protected against excessive damage. Keeping your gutters at their best is one of the most important things to do for your roof. They play a major role in the health of your home structure and roofing system. When a storm comes through, your gutters collect damaging materials such as debris, roofing materials, debris, and water. This system then carries these away from your roof, preventing further damage. Without this system, you can have excessive damage such as mold and rot. This is why it is so important to keep this system at its best. 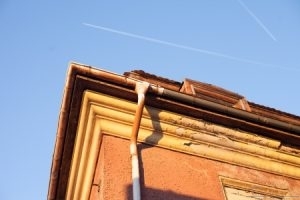 How can you tell if your gutters need repair? Rust and cracks are a sign of wear over time. This can also be caused by water resting in your system for a long period of time. You may also notice that your paint is peeling or bubbling along these areas, meaning the rust and cracks are below the paint itself. Fasteners keep your gutters sealed together properly and keep them along with your roof. Sometimes, this system can pull away on its own over time. However, if you find that you constantly need to tack the system back along your roof or that it is continuously separating, you may have damage in your gutter system. The purpose of your gutter system is to protect your roof and home by taking that water safely away. Naturally, this may cause some erosion occasionally. However, if your system is causing frequent erosion and damage to your landscape, it could be in need of repair. These signs are strong indicators that you need gutter repair as soon as possible. Do you need an expert eye on your system? United Roofing Services provides quality roofing and gutter repair for homes in Kansas City, MO, Blue Springs, MO, and the surrounding areas. Give us a call today at 816-228-1158 for your repair or replacement service! Posted in Uncategorized on March 29, 2017 at 4:47 pm by United Roofing Services.